Provided photo Edison State Business Management student Khalia Free is interviewed by DAP Products, Inc. Human Resource Manager and Edison State alumni Betsy Frappier. 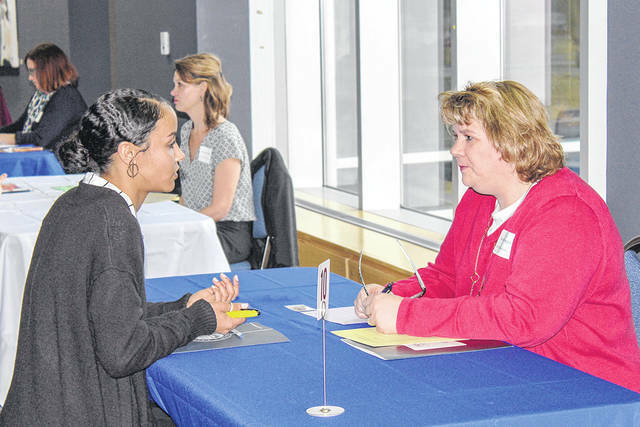 PIQUA — “Tell me about yourself,” are words that many new graduates will hear as they sit down for a job interview. But are graduates prepared to answer this along with several additional questions aimed at determining their skillset, adaptability, and personality? To become better prepared for job interviews, students in the Edison State Business Capstone class recently sat face-to-face with local business professionals for mock interviews. This year is the fourth year for the event, which prepares students for the interview process, and ultimately, securing employment upon graduating. “The mock interview event exposes our students to invaluable, real-life experience in interviewing,” said Sandra Streitenberger, associate professor of Accounting and Business. Leading up to the event students were provided with the basics of interviewing: providing a good first impression, offering a solid handshake, smiling, and speaking clearly and directly. The importance of verbal and nonverbal communication was also discussed at length in class. During the event, students were paired with professionals who interviewed them just as they would potential employees. The interviewers offered positive comments, opportunities for improvement, and suggestions for each answer the student provided. Similar to a real job interview, students were also critiqued on their professional appearance and soft skills. “This practice enables students to learn how to answer difficult questions, develop interview strategies, improve their communication skills, and reduce their stress before an actual job interview,” added Streitenberger. A total of twenty-two area businesses were represented in the mock interview process including, A.M. Leonard, City of Piqua, City of Sidney, City of Troy, DAP Products, Inc., Emerson Commercial & Residential Solutions, Franklin University, Goodbaby International–Evenflo, Hobart Service Division, Honda, ITW Food Equipment Group, ITW Warwash Division, Kettering Health Network, Midmark, Minster Bank, Norcold–Gettysburg, Premier Health–UVMC, Scott Family McDonalds, Speedway, LLC, Troy Chamber, Wayne HealthCare, and Weissbrod Consultants. The mock interview event is sponsored by Franklin University and incrementally funded by a Perkins Grant. https://www.dailycall.com/wp-content/uploads/sites/30/2019/04/web1_MockInterview.jpgProvided photo Edison State Business Management student Khalia Free is interviewed by DAP Products, Inc. Human Resource Manager and Edison State alumni Betsy Frappier.